It’s always too early to count out the Kinks, whose 19-year career has been punctuated by umpteen rebounds from internal conflicts, musical lapses, and rumors of breakups. 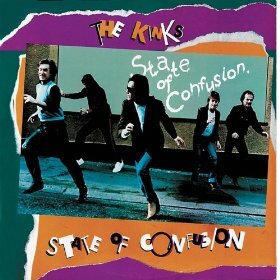 State of Confusion, the British outfit’s 28th American LP, ranks with the best evidence to date of the group’s talent and resilience. As fresh, ambitious, and energized as the work of any rising young upstarts, this creation of veteran rockers sparkles with the wit and compassion of leader/songwriter Ray Davies. Given its subject matter and the fact that the record follows the breakup of Davies’s marriage, State of Confusion could be viewed as his version of Dylan’s Blood on the Tracks. In “Labour of Love,” Davies sings that marriage can turn a man and a woman into a two-headed monster and in “Property,” one of the most poignant ballads he has yet written, he tells a tale of disillusionment and divorce that you have to suspect relates more than slightly to his own experience. With few exceptions, the rest of the album seems just as personal and just as wistful—though Davies’s humor and basically optimistic spirit prevent matters from growing too dreary. “Come Dancing,” the single that raced up the charts earlier this year, exemplifies the writer’s emotional balancing act by mixing sadness at youth’s passing with a savoring of its sweetest aspects. There’s also the musically snappy “Heart of Gold,” which is both a psychological portrait of a tough childhood and an apparent love letter to his girlfriend, the Pretenders’ Chrissie Hynde; “Don’t Forget to Dance,” a touching (though some would say sugar-coated) cheer-up message to “a sad and lonely heart”; and “Young Conservatives,” an only partly lighthearted jab at the Me Generation from someone who remembers when a very different sensibility prevailed. There are a few “scratches” on the record, particularly among the hard rockers, which can become grating and tedious. But the ballads and mid-tempo folk-rockers all evidence lyrical depth, addictive melodies, strong musicianship, and some of Davies’s most compelling vocals ever. For my money, that adds up to an album worth buying.